In October, James Moss moved to Denver from New York with his 1-year-old son, Zhi, in search of a better life. A friend offered him a place to stay and a job opportunity, but shortly after they arrived, things took a turn and both his housing and job were gone. "It seemed like everything I was trying to do was falling apart," Moss told KDVR. Days after learning that he was homeless, and while searching for a shelter, Moss had a chance meeting with Leon Logothetis, a motivational speaker, whose viral movement, #GoBeKind, promotes random acts of kindness. Logothetis, with camera crew in tow, approached Moss to interview him about kindness. Moss began talking about his recent experiences. "Everything I do is for him," Moss said of his son. "The reason I made this move is for him. To be in a peaceful place, the mountains, I want him to experience things that I missed growing up." Moss told Logothetis that his new move had been tough but that he believed his recent setbacks were all part of a divine plan. "You have to be brought down to your humblest point so you can appreciate other things that are waiting for you," he told Logothetis. What happened next set in motion a series of events that helped changed Moss' life. "Most people don't want to share their pain; I want to say thank you,” Logothetis told Moss. "And the way I'm going to say thank you is by giving you $1,000." Logothetis also put Moss and his son in a hotel for a week. Moss was brought to tears: "You gotta be freaking kidding me, man," he said. Logothetis posted the video, part of his #GoBeKind Tour, to YouTube as simply "Chapter 4: James." The video has since been viewed more than 690,000 times. What most viewers didn't know is that at the time the episode was posted to YouTube, Moss and his son were still in a shelter. They have since moved out, and Moss has a job working as a barber. The owner knew of Moss' situation and gave him a place to stay. 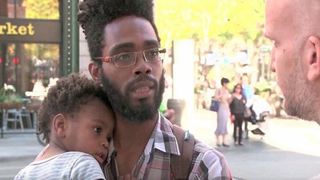 Moss brings his son to work with him to the barbershop, since he can't afford day care. The spirit of the video still moved viewers to kindness, viewers including Kayla Heskett of Goodland, Kan., who started a GoFundMe page to help Moss secure reliable transportation before the weather in Denver becomes unbearable. "Lets make this happen for him and his son and show him some love and that there are still good people left in this world," she wrote on the crowdfunding page. In five days, the page has raised some $32,000. "Just get me a car and a camper, you know what I mean?" Moss said with a laugh. "That's what I'm trying to save some money up to get." Moss told the news station that once he is on his feet, he plans to pay some of his good fortune back. "It's definitely a blessing, man," Moss told the news station. "I'm so thankful."